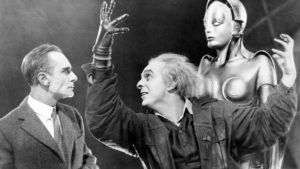 City Lights celebrates its 14th anniversary by kicking off a series of art film screenings curated by local artist, Gerald Moore starting with Metropolis. A true art film classic shot in 1925 in black and white, the setting is 2026 in a ‘futuristic’ city sharply divided between the working class and the wealthy city planners. The son of the city’s mastermind falls in love with a working-class prophet. Deception, humanoid robots, the hardship of the working poor, privilege and class struggle along with dream hallucinations are depicted in this “visually awe-inspiring science fiction classic from the silent era”.